While one session is great, five are even better. Work with Ariel over a period of weeks or months to improve your practice. Find alignment, discover balance, strengthen your core, stand on your head! Five hours all about you. . . and save when you buy five sessions! Got a question about a pose? Want to make sure you are doing your vinyasa correctly? Having pain in your wrists or shoulders during class?? Need modifications? Spend twenty minutes with Ariel, focusing entirely on YOU, your alignment and your questions. Book your private mini-session now! Have a quick question about nutrition? Ready to eat more healthfully? Need help planning a weekly menu for yourself or family? Want to shed those last few pounds but can’t quite figure out how? Set aside twenty minutes and twenty bucks for you and your nutritional needs and discover how to eat your way to wellness! 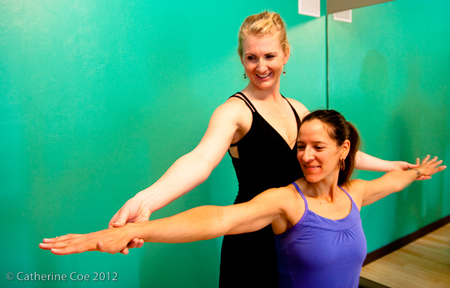 Ariel's training background and teaching is a fusion of Ashtanga and Iyengar yoga styles. Classes are catered to you and your needs.